The office has terrible sound pollution. I could hear another patient's entire conversation with the doctor which mademe feel extremely uneasy. If architectural changes cannot be made, music should be played in each room to muffle the private conversations. The office has terrible sound pollution. I could hear another patient's entire conversation with the doctor which made me feel extremely uneasy. If architectural changes cannotbe made, music should be played in each room to muffle the private conversations. Very intelligent doctor. He treated me with respect and care. Would definitely return to this clinic. 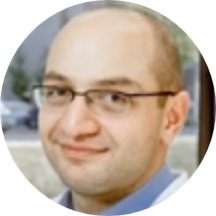 Gevorg Sedrakyan is an internist who accentuates his medical practice with insight, analysis, and comfort. He is currently treating patients in Alexandria, VA and is affiliated with the Sentara Norfolk General Hospital. He is certified by the American Board of Internal Medicine. Dr. Sedrakyan’s bedside manner and kind disposition allow him to relate to his patients effectively, and educate them on their conditions and his course of treatment. He places great emphasis on his patients’ understanding and their emotional and physical needs. Magno P, Giday SA, Gabrielson KL, Shin EJ, Buscaglia JM, Clarke JO, Ko CW, Jagannath SB, Canto MI, Sedrakyan G, Kantsevoy SV. EUS-guided implantation of radiopaque marker into mediastinal and celiac lymph nodes is safe and effective. Gastrointest Endosc. 2007 Aug;66(2):387-92. Shin EJ, Ko CW, Magno P, Giday SA, Clarke JO, Buscaglia JM, Sedrakyan G, Jagannath SB, Kalloo AN, Kantsevoy SV.Comparative study of endoscopic clips: duration of attachment at the site of clip application.Gastrointest Endosc. 2007 Oct;66(4):757-61. I would recommend this doctor - professional and knowledgeable, very good manners . The doctor pointed out a discrepancy in my medication; however, it was not done in a diplomatic way. It came out as an accusation. I realize that the are regulations; but, not everyone is guilty of wrong doing. I simply had an illness that needed to be fixed. I did not have Dr. Sedrakyan I had a gentleman named Victor who was very good! Dr. Sedrakyan is one of those doctors that immediately puts you at ease with a hello and a handshake. I thought he was excellent and would highly recommend him and the practice. The doctor came in and spent about 3 minutes in the room. I came in for a sinus infection or a cold, unsure what one. He did not examine me at all, just said he was going to write me antibioticsand sent me on my way. I am 27 weeks pregnant and did not feel taken care of at all. For my initial visit, I saw Doctor Sedrakyan. He told me to come back for a check up two days later. I came back and ended up seeing another Doctor. While everything was awesome - the wait time, the doctor's bedsidemanner, and the atmosphere - it ended up being a bit disappointing as the results have not come back yet from the labs. I don't think it was anyone's fault because it just so happened that it was Memorial Day weekend. This practice is awesome, but my copay was a lot. It would have been better if I delayed my check up / follow up at a later date when they had the results. Now, I have to come back a week later and end up paying another copay visit. Everything was great, but the timing was off. No one's at fault, it's just an unfortunate series of events. Doctor Sedrakyan was awesome. He listens and doles out great advice and diagnoses. He has a genuine caring attitude. He is stern when he needs to be, but never comes across as dismissive. This is a great clinic. Unfortunately seeing urgent/immediate care on a clinic awning can sometimes mean rushed or sub-par treatment. But this clinic is very well run, with caring and attentive doctors. I have gotten very bad care at urgentcares before, felt that my doctor half listened and gave me a script without real thought so I was hesitant about going to one again but I am happy that there is a such a great clinic near me if I need to be seen late or on a weekend. He was very nice, listened to my problems, extremely understanding, and nice. The doctor and staff were professional and the on site x-ray service was helpful. The initial wait to be seen was just longer than preferred or expected at 50 minutes. I will, however, be going back. Did an excellent job, had efficient staff, and answered all my questions. This is the 2nd time I have been to this office for company required physicals. It helps if you send across your info via zoc doc ahead of time. Very happy that they had an onsite x ray machine, a lotof place don't. My company requires a lot of tedious and thorough detail items, all were handled without any problems. This man saw me for all of 5 mins, kicked me right out the door with a prescription in my hand, had verified that my insurance covered my appointment BEFORE I went in and then has been harassing me to paya bill that I shouldn't have to have paid for. NOT worth it! It was actually another doctor but she was great. It was a really great experience overall. Dr. Sedrakyan was clearly knowledgeable and professional. He quickly gave me his recommendation within 5 minutes of seeing him. BUT, the process felt incredibly rushed. He would ask questions about how I was feeling and nearly cut me off togo on to the next question. It took me off guard and I don't think I was able to ask the questions I wanted to because I felt so rushed. I felt as though I was being pushed out the door so he could move on to the next patient. During the appointment, he took a blood sample for tests (which caused my arm to bruise). It has been 4 weeks since my appointment date and I have heard nothing from the doctor's office. Dr. Angela was very considerate and throughtful. She took time to listen to all of my issues and was very proactive in getting me the help I needed. Great experience .... In and out ! Everything is perfect with this clinic. Dr Gevorg Sedrakyan and his staff are amazing. Great experience. Will come back when needed and will recommend to others. I chose this office as my primary care facility due to the professional manner and inviting service. He provided the reason for the problem I was having and it seemed to go away. finially a good intelligent doctor and pa. Very well organized and the physcian was knowledgeable and genuinely concerned about my health. He was nice enough, but seemed to discount the validity of my chief complaint, saying that my symptoms were "not that big of a deal." Great place. Easy to find. Very professional staff. Nice Guy. First appt was a positive experience. I love the approach to treatment for any illness. I explain what's wrong and get additional questions, suggestions. Extremely quick wait time and we work together to determine the best treatment options for the problem. I have no problems with my Medicare insurance. Very friendly and knowledgable. Made me feel comfortable in a time of embarrassment. Would def recommend! He's great, personable, knowlegable, and interjects humor. Clean offices, friendly staff, minimal wait time. Doc was thorough and to the point.